Im considering getting one of these boards for Melbourne and probably most of the time would use it in the bay. Does anyone have any opinions or used one/both of these that can give any thoughts on them? I know the Magic Ride is one of the wider body style freeride boards compared to the All Ride which is a more traditional thinner body freeride. Hi Steely81, just sent you a email. Hey Steely, I'm an intermediate sailor and I use the big 154 Magic Ride and am 100kg. It's great for me because it does nothing perfectly, but does everything pretty well. It's probably not as fast as the All Ride but is just a great general purpose board. My reasons for the Magic were that I wanted something with enough buoyancy to easily uphaul, enough width to be stable for tacking and enough looseness in the tail to be manouvreable and to help me learn to gybe and a shape that eats up chop, it hits all of these targets. The 140 Magic ride is very similar to the 154 in shape with less volume, but the smaller ones are apparently quite different to what I've got. I'm super happy with my Magic Ride. The new school wide thin freemove boards are great light wind boards for the bay. I would not use one above 18 knots, unless it's flat (which is hardly ever in Port Philip Bay). I dont have a board yet but i have a 4.8 and a 5.5 sail. If i did get a magic ride, i was looking at maybe the 103L board and for the All ride probably the 106L. Im 70kg andI dont really like using larger sails. I know it will restrict the conditions i can go out in, but if it gets lighter, i can kite. I am the same weight. Those are 18+ knots sail sizes. Get an 85-95 L FSW instead and kite if it's less. Greetings. My sailing is mostly on a fresh water lake in Colorado, USA. The lake is about 800 acres (3.25 square kilometers) and is roughly a mile across (1.6 kilometers). I weigh about 165 pounds (75 kg) and stand 5 feet 9 inches (175 cm). I sail about 50 to 70 days each year. I consider myself good but I am definitely not one of the better sailors at my lake; this is not false modesty---my top GPS speeds are 5 mph slower compared to those of my friends and my planing jibe completion rate probably is only 20% or so. I owned the All Ride 106 for two years, then traded it for a Magic Ride 104, mostly because I couldn't tack the All Ride to save my life. More about this in a second. 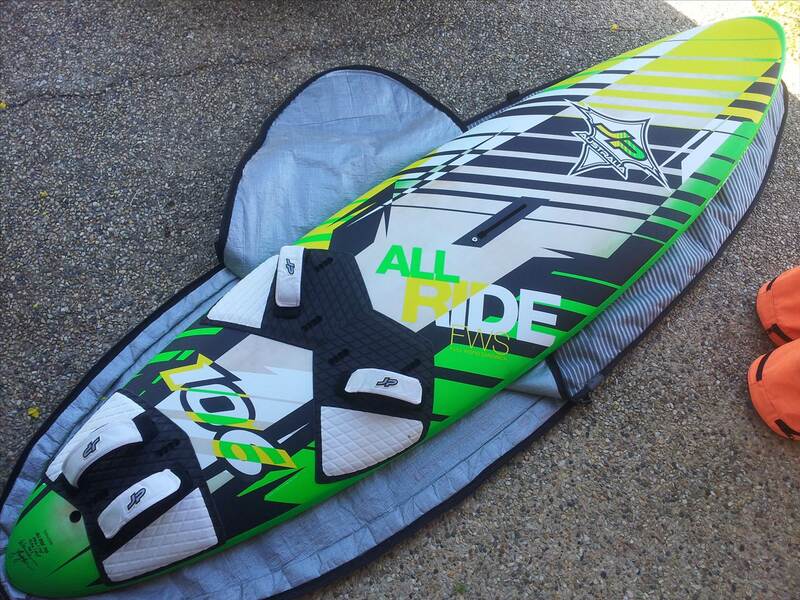 I sold the Magic Ride after two seasons and will replace it with a narrower board, something in the 65 cm range. (The Magic was 69, if I recall.) Both were in wood construction. First, I know the wider Magic Ride is supposed to plane earlier, but it didn't. The All Ride was an amazing early planing machine; it would plane with a 6.5 meter Ezzy Cheetah whenever there were dark spots on the water (and this is in thin air at 6000 feet, where the air is 18% thinner), which usually happens here at about 17 mph of wind. No white caps were required. I think it took at least another 3 or 4 mph of wind to make the Magic Ride plane. Maybe it was just me, but the Magic seemed really slow to get planing. Second, when planing, the All Ride was faster by a lot. My best speed on the All Ride was 30.0 mph and I was almost always reaching speeds of 25 to 30-ish. My speeds on the Magic were usually around 24 to 25 mph with a high of 27 mph. I keep a very detailed sailing log, so these numbers are accurate. Third, sailing the All Ride was much more fun. It was livelier, easier to control in chop, faster, and far easier to plane through a jibe. I hate to say it, but the wide boards are not that much fun. They have their place--I enjoy using my formula with a 9.5. But for normal sailing, the wider boards like the Magic ride seem a bit dull. I also owned an RRD FireMove 122 (79 cm wide) and sold it last summer, and I replaced it with a Goya Bolt (72 cm wide). The Bolt is a lot more fun. Narrow is better. I spent a lot of money buying the FireMove and Magic Ride and neither did what it was supposed to do as far as planing and jibing. And they just were not that much fun to sail. Fourth, the one thing the Magic does better than the All Ride is tack. I am a horrible tacker. I would fall on about 75% of my tacks on the All Ride, which is why I got rid of it, but I think I never fell tacking the Magic Ride. Good thing, too, because the water at 6000 feet is COLD!!! The Magic is quite easy to tack. I think its mast track location front to rear is better and its width helps too. Lastly, if you go for a wide free move board, go smaller in volume than you think. As I said, I had a Firemove 122. I think I would still be sailing and be happy with a FireMove if I had gotten the 112. The 122 was just too large. The step across for the jibe was too awkward. The width--which is supposed to be an advantage for early planing--created drag and hindered planing. The width makes up for smaller volume than you might be accustomed to. By the way, if you have wide feet (and I do), be careful with the straps on either the Magic or All Ride. It is hard to make the strap opening on JP products wide enough with JP's system. The straps on the FireMove were much better quality and much easier to adjust. The fin on the JP wood construction is decent but not great. In short, I regret trading the All Ride for the Magic Ride. If I were you and if the choice were between the Magic Ride and All Ride, I would take the All Ride. But I would also look at a Naish Starship 100 or a Goya Bolt 105. I don't know about availability where you are, so if these are not available, that makes the decision easy, right? Best of luck on your choice. Knowing what to buy is one of the harder things about our sport. And there is so much hype from the board makers about short wide boards that I got all confused and spent far too much money because I believed it. Thanks Jiberjohn, a very detailed opinion and much appreciated. I know what you mean with tacking and i generally jibe but on smaller boards you have to be pretty sharp with your transition to avoid getting wet. I'm also an All Ride owner, the 97Lt., I use it only in the ocean when the winds are light (my light wind board). I've tried wider boards, but I didn't like them, they just didn't fit my sailing style. Very pleased with the All Ride, early planer for sure, better than the wide boards I've tried, and I get so much speed on the thing that when I sail into a hole, it just cruises right thru it, maintains it's own speed very well. It felt to me like the wider boards scrubbed off speed quicker, I'm pretty sure it's because of its width. That's about as far as I can go with my opinion, I no longer sail on lakes or bays. Give me a several more years of age, and I'll probably be back on lakes and bays................... with my All Ride, or a newer one by then. Hope I've made the right choice in that case. Wasn't last year's Lancelin Classic won on a large Magic Ride? MF2, that's the same year that I have, mine's the 96 (not 97), you'll be happy. I ride mine in heavy chop quite often (and waves), so I have the front straps in the inboard holes, and a single strap in the rear. Works really well in that configuration, for flatter stuff, the way it's set up in the pic works really well also. Stock fin for flatter stuff, wave fin for the waves. Ive got the 111 Magic Ride and its ace. I also heard a certain ex champ likes them as well, so they cant be that bad. I havent ridden an All-Ride though, so i cant comment on them. He was only using a 7.5 metre freeride sail though, and finished 1 minute behind the winner when Guy was on a freeride board. One other thing about the All Ride 106 vs. Magic Ride 104 (and as I said, I have owned both. The Magic performs better with a 7.5, probably due to its width. Neither board is ideal for 7.5 or an early planer with a sail that large, but the Magic carries the 7.5 decently enough. Hehehe. I'll let you know in good time Phil. Sweet. Hope it's what I'm looking for as I was torn between the Magic Ride and All Ride. Gave this the nod due to being narrower. I'm old school and like narrow boards. Been finding the wider slalom boards very hard on me these days so wanted something narrower and more forgiving in rougher water. I like the rougher water but slalom boards want to kill me as I'm not a big guy to hold it all down. Anyway that is my 2 cents worth on the topic but in the end you really can't go wrong with either I reckon. can we get conclusions after ?? and perhaps even some videos ?? Compared with Port Phillip bay this is flat water. I have owned the 116 pro Allride and I couldn't wait to get rid of it. It didn't plane early, didn't do anything very well and felt like an all-rounder for intermediate sailors, and it felt very old school. The 111 Magic Ride I replaced it with on the other hand was everything it was advertised as and more. It is a great bay board as it handles chop and swells with ease, planes early, gibes like a dream and it's fast. I've since bought the 118 as well, in Textreme carbon which does all the same good things in 12 -14 knots with a 7.8 race sail. And I already have a full set of JP Slaloms and a Super Lightwind in Textreme. I have been sailing 35 years, was a sponsored sailor for Mistral and Sailworks, wrote for magazines and I've owned over 50 boards. I rarely waste my time with forums but maybe I can save you wasting your money. Buy a Magic Ride Pro in a volume that suits your weight and the sail sizes you're going to use. I notice you've already heard from F2, a sponsored sailor and an old friend of mine. He has undoubtedly recommended the MR too. Well said Paul, I have 3 magic rides now, and 5 JP Slalom and speed boards, you can not go wrong with the magic rides they great all round boards,great in chop and are very quick to get on the plane also they are fast have done over 34 knots in open ocean on the 104. Still hoping for a definitive conclusion? Hey Madlad, how fast was the wind blowing for that footage? It might be useful for Steely to check again that 6.7m sail size. One of the things I've found with my 154 Magic Ride is that it planes really quickly (compared to the big Starboard Express that I learned on) and also doesn't seem to require as much sail as other similar sized boards my mates are using. Even though I'm relatively inexperienced at windsurfing, my more experienced mentors have commented on how quickly my board gets onto the plane and how I can zip around with smaller sails. Again Steely, I'm using the biggest Magic Ride which will be different to the sizes you are looking at.